Weekly Happenings: We had a pretty low-key week as far as extra out of the house activities were concerned. Monday night, we went to Bass Pro Shops one more time so Joseph could play with all the fun Christmas stuff and get his picture taken with Santa. Friday night was the ward Christmas party. It was pretty low-key, too. Dinner, singing Christmas carols, and a short talk given by the bishop. It was nice to have a relaxing night. 🙂 Other than those two activities, we were mainly home-bodies. Getting ready for Abigail’s arrival, finals, and the weather kind of influenced that decision. The Weekly Weather: It’s been COLD. Now, I know it’s all relative. I know that it hasn’t been as cold here as it has been in other parts of the country, but this is South Texas. When the temperature drops into the 40s-50s during the day (30s-40s at night) and the humidity jumps into the 70s, I don’t care what anyone says…it is down-right cold. We’ve been layering like crazy to stay warm. We’re supposed to have a brief respite tomorrow, but then it’s supposed to dip back down. I guess winter has arrived! 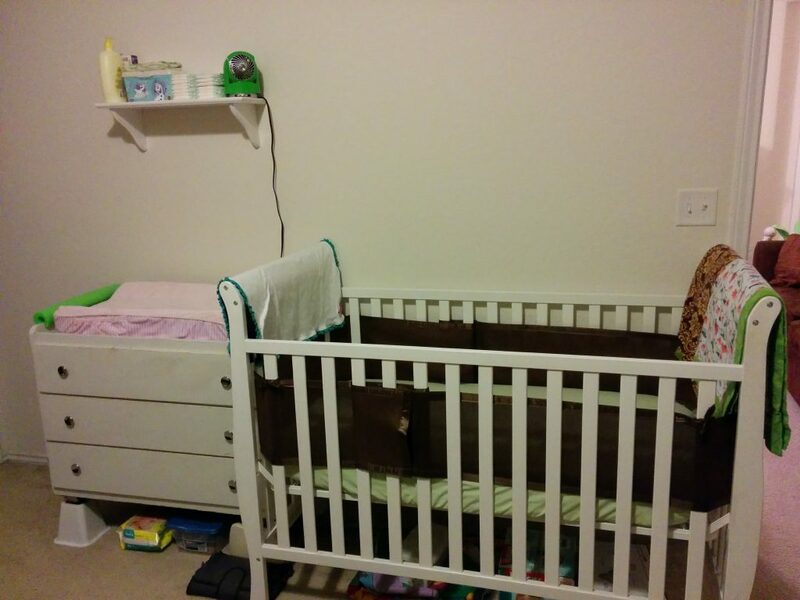 What Sarah’s Been Up To: In addition to being Joseph’s taxi and teaching piano, I’ve been nesting like crazy. My to-do list is almost a have-done list, though. There are a few things left on there, but they are sort of last-minute time sensitive things. The biggest thing was getting all of the littlest baby clothes washed and put into Abigail’s dresser, along with washing all the blankets, towels, etc.. It took a while, but it is done! My doctor let me know that she plans on inducing me anytime between the 21st-28th (unless I go into labor before then), so the more we can get done now, the better. We’re leaning towards before Christmas as opposed to after, simply because there are more options of days that are not holidays (which would be days that the hospital would not schedule one) and it would be nice to be home with her before Christmas. 🙂 Never mind the fact that by picking an earlier date, it’s less likely that I’ll go into labor on my own on Christmas Eve or Christmas Day. I meet with my doctor again tomorrow. Hopefully we’ll be able to pick a date then that works with us as well as with her on-call schedule. 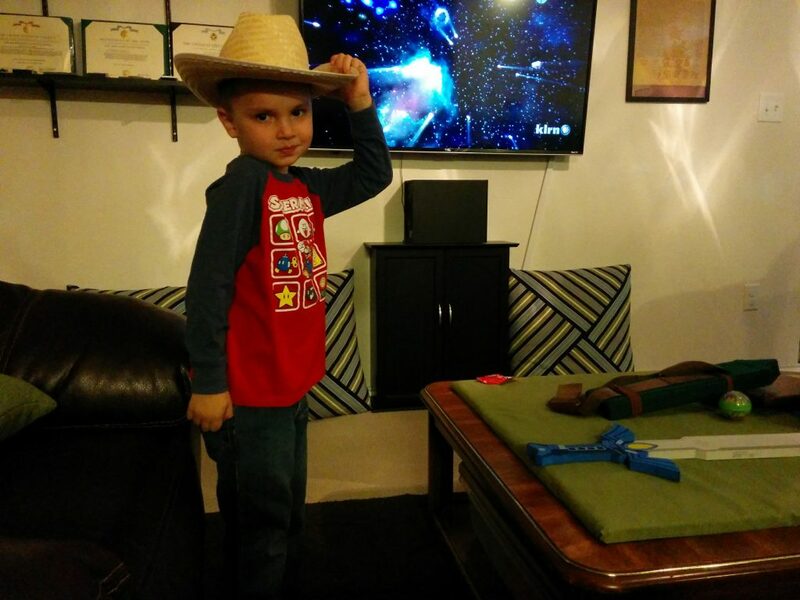 What Joseph’s Been Up To: Playing around the house, drawing, reading, school, etc. He had a blast at Bass Pro Shops. I didn’t get any pictures, but he loved playing with the bow and arrows game, the shooting game, and the diggers in the ball pit. 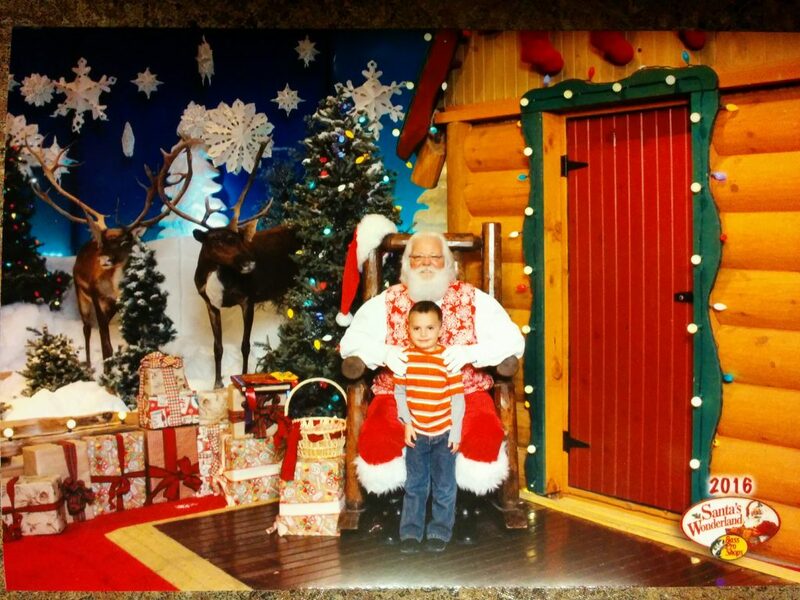 He was a bit nervous to meet Santa, but ultimately decided that it was an okay idea. We try really hard to let it be his decision because his comfort level is what’s important. He’s also been a huge helper around the house. It’s been a bit more difficult for me to do some things and he is quick to come help. I love his helpful heart! The dark mornings have made it so that this little guy is sleeping in a bit more than normal. 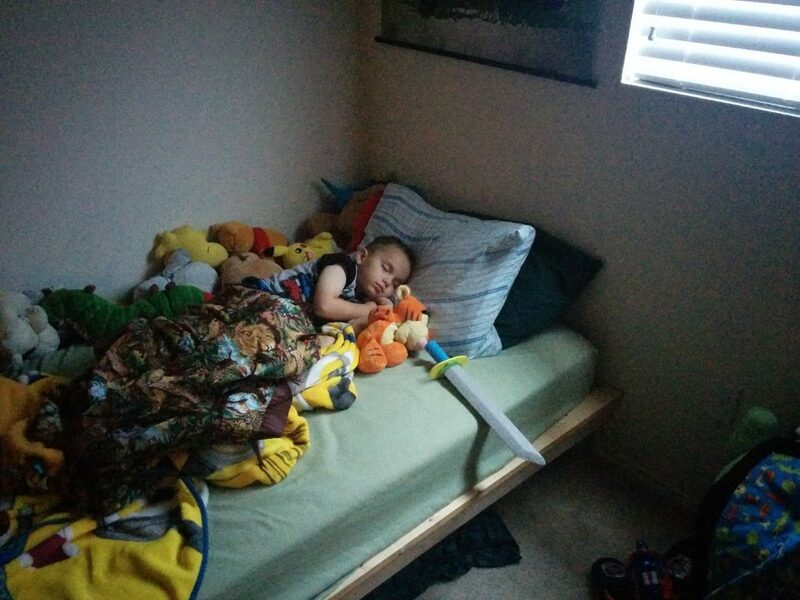 I loved discovering the foam sword in his bed one morning. 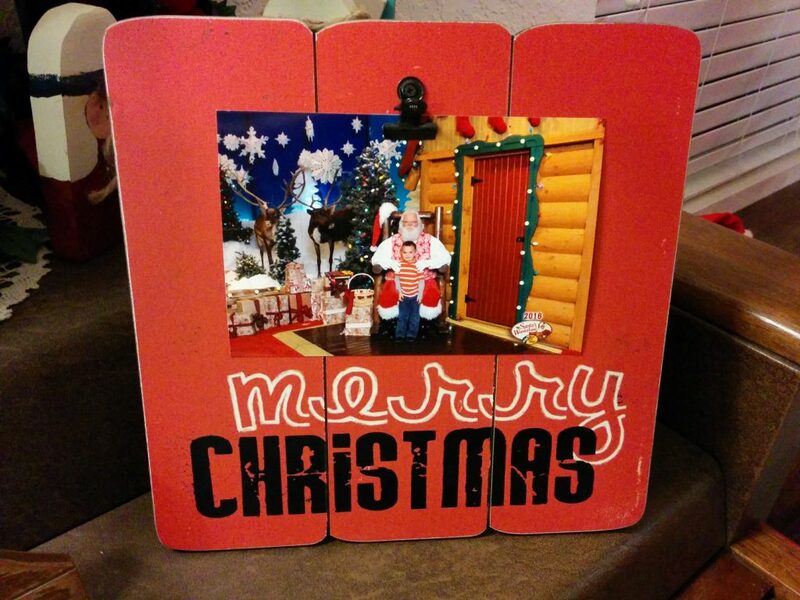 This year, in addition to getting to see Santa for free and getting a free copy of the picture, Bass Pro Shops gave us this cool wood frame. This apparently was a weekday-only type of deal (people who went on the weekends didn’t get the frame). This was an extra bonus we didn’t realize at the time (we were just avoiding the weekend because we knew it would be crazy, haha). A close-up of the picture. Last year they let us have a digital copy for free, which they aren’t offering this year. I don’t mind too much, though. I was pretty impressed with getting the frame which we can use in years to come and I’m grateful that we can still get one free option of the picture. 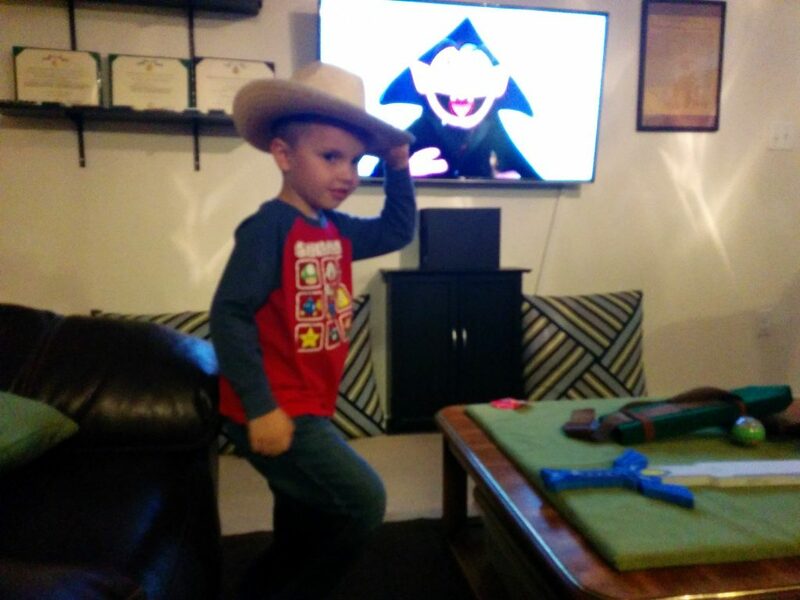 Cowboy Joseph stomping along to the Count’s beat (each episode they stomp out the the number of the day). Whoops. I got caught taking his picture! 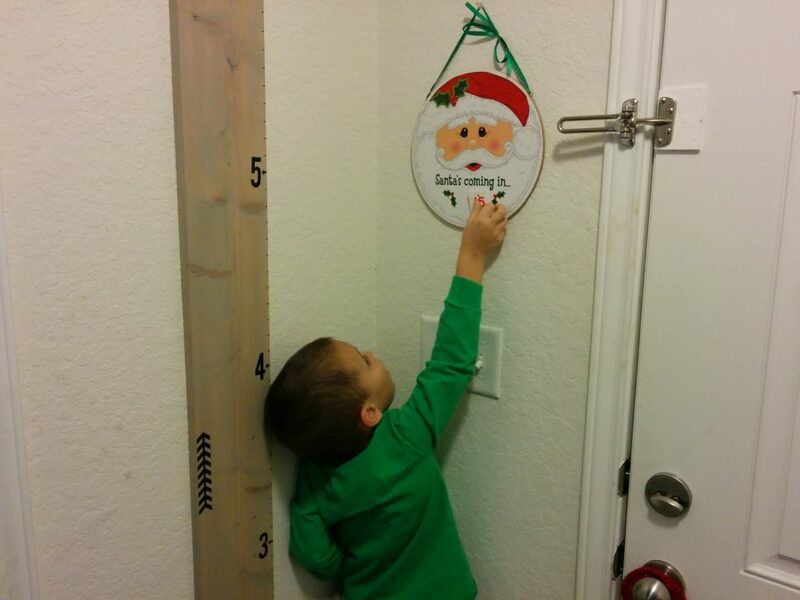 He’s really into the Santa count down this year. He also looks way taller than he actually is because he’s standing on steps to reach the count down. 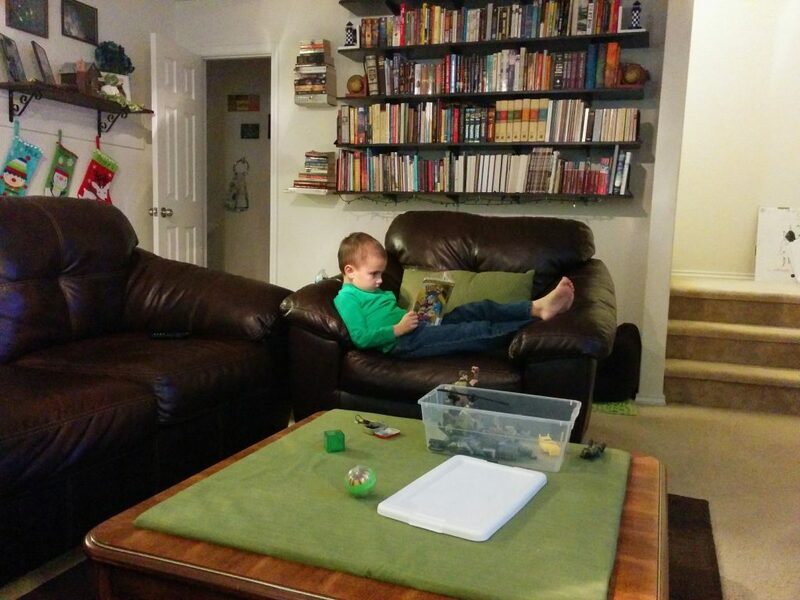 He opted to spend a chunk of one morning reading a Pokemon comic book from the library. 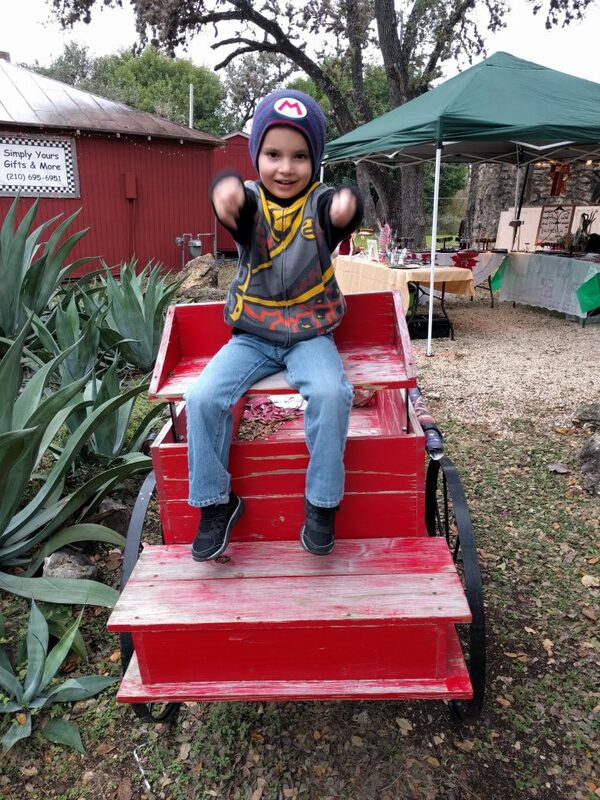 “Driving” the wagon in Old Town Helotes while at the craft fair with Paul.